How is Ganesh viewed in Tibetan Buddhism? I was recently given a (rather nice) jeweled painting of him and was wondering what to do with it. 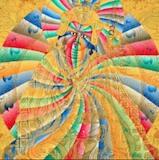 Jangchup Donden wrote: How is Ganesh viewed in Tibetan Buddhism? Put it on your shrine. Ganesh is a worldly deity, under the command of Vajrapani. It's an odd thing but I keep bumping into Ganesh in TB. There must be a reason for that. There are prayers to him (as Ganapati) I don't know if he is considered Enlightened or not. Same with Saraswati. Konchog1 wrote: There are prayers to him (as Ganapati) I don't know if he is considered Enlightened or not. Same with Saraswati. The fomer no, the latter, yes. She is Mañjuśri's consort as well as Shiva's wife. For example, when the premission blessing is given, there is always a torma given to Parvati, who is Shiva's other wife, who because of her jealousy will otherwise afflict practitioners of White Sarasvati with poverty. Oh thanks. Is that something to worry about if I just say prayers and make offerings to Saraswati? otherwise as mentioned before "Put it on your shrine. Ganesh is a worldly deity, under the command of Vajrapani." Who's this then and why are they being crushed by a protector? OMG! Greg! You posted a picture of a protectors feet! What were you thinking? What about your Samaya??! gregkavarnos wrote: Who's this then and why are they being crushed by a protector? However in Hindu mythology Vinayaka is actually form of Ganesha who's primary function is removing obstacles. catmoon wrote: It's an odd thing but I keep bumping into Ganesh in TB. There must be a reason for that. Ganesh seems to get around. There was an article sometime several years ago in Tricycle written by a student of the Khenpo Brothers who kept seeing Ganesh. They also told the author that Ganesh was considered a worldly deity under command of the Buddhas and gave some advice. Yes, for example, there is a Ganapati sadhana that is part of the thirteen golden dharmas. Ganapati is a common worldly dharma protector in Nyingma, as is Shiva. According to Lama Wangdu he is more than worldly and is a natural protector to practitioners of Chod. Mahakala stands on the body of the white elephant king, Ganapati who is worshipped by Hindus before they worship their guru since he is the Lord of Obstacles.More information about him may be obtained from the Mahanirvana Tantra.After our Lord's Enlightenment, he was converted by Mahakala and appears under the latter's feet.He who worships Ganapati according to Tantric Buddhism has a real helper who helps to overcome obstacles. Namdrol where do you get the info that Saraswat is Shiva's wife? Can you quote it please as tradtionally she is viewed as the wife of Brahma. There's also the Ganapati-Ganeshwara Hridaya Sutra which is available in English on-line. If interested, try doing a Google search. As a sutra, anyone can say/read it without necessarily having received lung, although lung can make the practice even more effective.